Amon the Devourer, also known as Ammon, Amaimon, Amoymon, Amaymon, and Aamon, is a great Fomori Lord. Similar to Bael, this demon has been worshiped as a god by many ancient peoples. He commands 40 legions of his brethren. When conjured, Amon is said to appear as a wolf with a serpent’s tail, vomiting flames and sulfurous fumes. To protect oneself from this foul breath, the conjurer must be in possession of a Silver Ring, duly consecrated and worn on the middle finger of the left hand as a form of protection. When the ring is presented and he is commanded, the demon will cease spewing forth the poisonous fumes. An outdoor conjuring is recommended for Amon. Sometimes when evoked, he will appear as a human with the head of a raven. He can also be compelled by a conjurer to take this second form, if appearing in the first. He is stern in countenance and not one prone to humor or gentle words. It is rumored that Amon is in service to the demon Astaroth, but details regarding this are ephemeral at best. Some sources also state that he has power over the demon Asmodai, and viceversa. 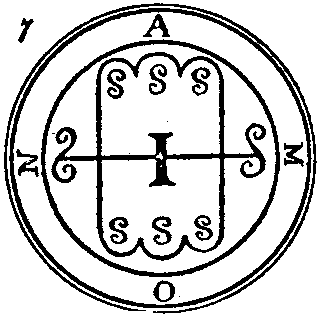 In the summoning of Asmodai, if one does not stand upright and remove their hat or cowl in a sign of respect upon completion of the evocation, the gate will bring forth Amon instead, and he will doom their work… and possibly put their mortal form in danger if they are not strong of will and knowledgeable of exorcism.